Secondary bone cancers. 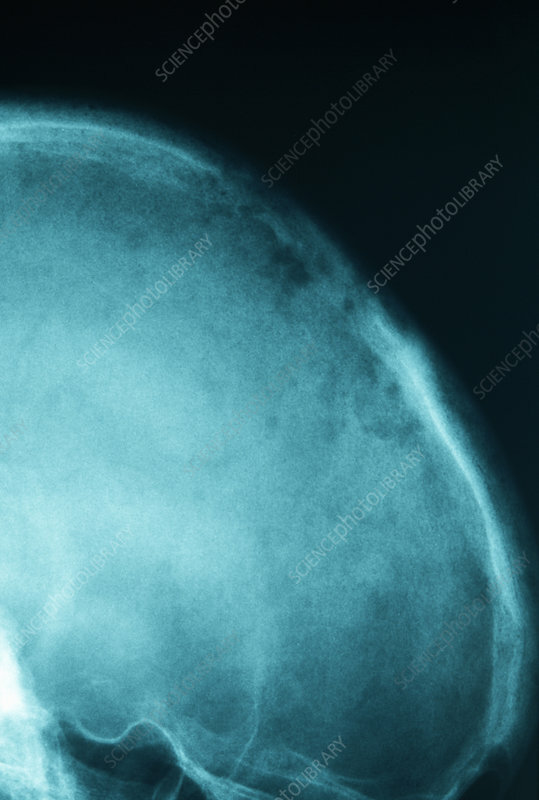 Side X-ray of the back of the skull of a patient with secondary cancers (metastases) in the skull bones. They are seen as the dark patches (some at upper centre). This type of bone lesion is described as lytic, referring to an irregular pattern due to cellular rupture. The cancers spread (metastasized) from a primary cancer elsewhere in the body. Secondary cancers are treated by whole body (systemic) methods, such as anti-cancer drugs, to target the cancer cells that have spread. Metastatic bone cancers can be treated with beam radiotherapy. Bone cancers cause severe pain. Often the spread of the cancer is irreversible, and the prognosis is poor.